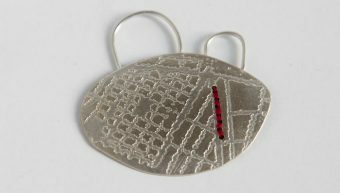 The Kildas at the Barony Centre in West Kilbride is an exhibition of medals made by artist Deirdre Nelson following her modern day pilgrimage in search of St Kilda that took her to the Kildas of Scotland, Australia and New Zealand. The Kildas project emerged from Nelson’s interest in Hirte and St Kilda, an archipelago 40 miles west-northwest of North Uist in the Atlantic. Her research and reading realised myths surrounding the islands origins and inspired her to look to St Kildas further a field. What became swiftly evident was the non-existence of ‘Saint’ Kilda. Knowing there was no ‘Saint’ Kilda, why did Nelson embark on her travels? Why the medals? And, who are they for? Without a saint to seek or decorate, the purpose of Nelson’s journey was to celebrate and reward present day St Kildans she met along the way. People who demonstrated saintly qualities like kindness, patience and generosity. A baker, female footballers, a youth wildlife ambassador, lifesavers and Mums amongst others, became the ‘saints’ for which Nelson created medals. Each intricate crafted award honours the individual saint, with their virtues, roles in society and geographical positions, represented in the medal’s form, markings, imagery, construction and materials. Sometimes this is literal, as with sailboat shaped medal for the St Kilda Surf Lifesaving Club, and sometimes not. The medals are made of repurposed silver coins, combined with wool (Soay and Merino sheep) and sand embedded in bio resin collected from all three countries. Known for working primarily with textiles and using hand crafting techniques, Nelson set herself the challenge of learning metalworking techniques in this project to incorporate metal and realise the medals. Working closely with contemporary Scottish jewellers Marianne Anderson and Alison Macleod in their studio she has gained a foundation of jewellery skills to enable her to manipulate and reform the collected coins into the desired shapes and to enable incorporation of her signature, and in this case delicate, hand stitched, crotched and knitted textile elements. The medals and their brief accompanying text about the ‘saint’ cause you to pause for consideration. Who is the medal for? Why do they deserve it? Where are they based? Tane is a Ngāi Tahu Maori, proprietor of the Free Shop, St Kilda, New Zealand and a fan of Scotland, particularly the Loch Ness Monster. His oval pin on medal etched with a map, stitched with red thread and featuring two loops at the top intrigues. The medal celebrates Tane’s provision of the shop in his house for his local community, hence the map, who have been getting stuff from him for free for three years. 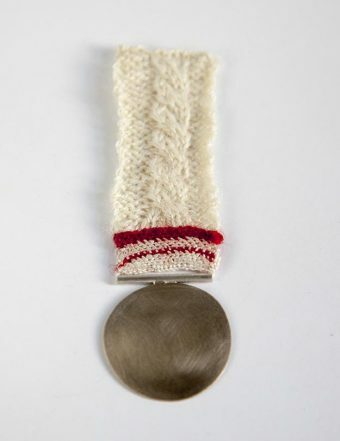 Dave’s medal conforms to the form with which we are most familiar; a round metal disc suspended from a ribbon, that is in this case is a cable Soay knit. Now a Conservation Volunteer on St Kilda and island devotee, his first encounter with the Scottish island was on National Service in 1958. When asked who of all the saints could be St Kilda, Nelson proposed Dave. A man with the saintly qualities she sought and the definite connection to the place of St Kilda. The Kildas project links both past and present, north and south and the people who inhabit the Kildas. The medals physically highlight global differences and similarities in people, place and context, engaging us in social commentary. Nelson’s journey and resulting exhibition brings us perspective and insight into contemporary life on the Kildas. Through beautiful, intricate objects and short biographies it positions us closer to the three places and their people. It certainly takes us beyond the often over romanticised view of the Scottish island. For Nelson, exhibiting the medals isn’t the culmination of The Kildas. Her ambition is to extend the tour to the Isle of Harris (the closest populated island to Scotland’s St Kilda) and the St Kildas in Australia and New Zealand with the intention of gifting the medals to the saints. The Kildas embodies Nelson’s skills and international track record as an artist facilitator working with and engaging groups and communities in their locale and relevant social and environmental issues through craft processes. Nomadic and inquisitive by nature, Nelson is well suited to this way of working. As with her previous projects focussed on people and place the work is always given back to those who engaged, supported and made things possible. The ceremonial gifting of the medals to the ‘saints’ will be a fitting return to the start of Nelson’s pilgrimage and opportunity to acknowledge and thank those involved with and supportive of The Kildas. Perhaps this will be the point at which Nelson, the Medallist, will acknowledge her saintly virtues and honour herself with a medal. The Barony Centre in West Kilbride, a former church, is an apt temporary home for the exhibition featuring a display of Nelson’s design work, material experiments and research into the saints and their locations alongside the medals. The Kildas is part of the Glasgow 2014 Cultural Programme, a partnership between the Glasgow 2014 Organising Committee, Glasgow Life and Creative Scotland. It is supported through the 20 for 14 programme which saw Nelson, one of 20 Scottish artists, lead a creative project inspired by the unique cultural, social, political and historical contexts of the Commonwealth and Glasgow’s hosting of the Commonwealth Games. Visit the Barony Centre on Sat 21 May and hear a talk by Deirdre Nelson from 11am-12 noon followed by an afternoon workshop from 1.30pm-4pm when you can work with Deirdre to make your own saint’s medal for someone you nominate for ‘sainthood’ which will be exhibited in the Barony Centre’s Mezzanine gallery until The Kilda’s exhibition closes on Sunday 5 June 2016.